Here are Sky Blue Lofts 10 unusual loft conversions! Yes, imagine your own bar for friends to come over and enjoy. No need to brave the elements on windy, rainy days or to fork out for a taxi on the way home. Use clever lighting, use bar stools and even purchase an ‘old skool’ arcade game. You can even hire mixologists for an evening to teach you how to make your own cocktails! Move over Tom Cruise! This one is probably everyone’s idea of the perfect film viewing place. You won’t have to pay costly ‘flix’ ticket prices, endure soggy nachos or worry about if you’re slurping your drink too loudly! Install tiered seating if you’re looking to accommodate a larger audience, or go for a couple of luxury leather electric recliners, complete with massage function and drinks holder. Have the walls finished with suede effect wallpaper to help the acoustics and finally, get the biggest screen you can muster into the loft. Action! Let the kids literally climb the walls, or the parents! Either install a stand alone wall or cover all walls around the room as part of a loft conversion gym. Kids NEED to be able to play as much as possible, especially these days with the temptation for children to pick up a device to keep themselves amused. It’s not always easy getting your darling cherubs out in the fresh air, notably if the weather looks a bit dreary. 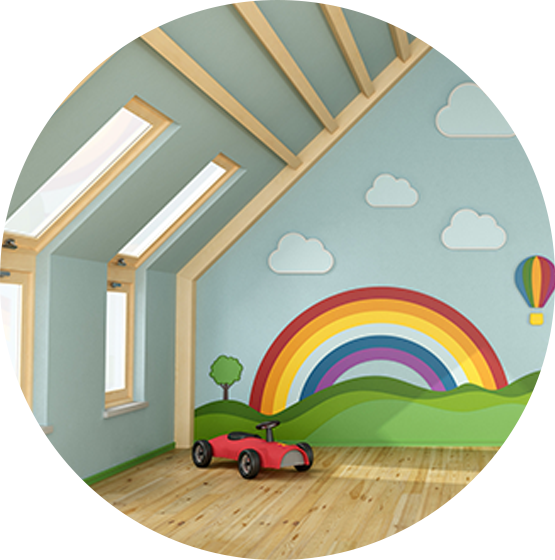 So why not bring the outside in and turn your loft into a kids playground! Use construction pipes to create monkey bars on the ceiling or up the walls as a ladder. 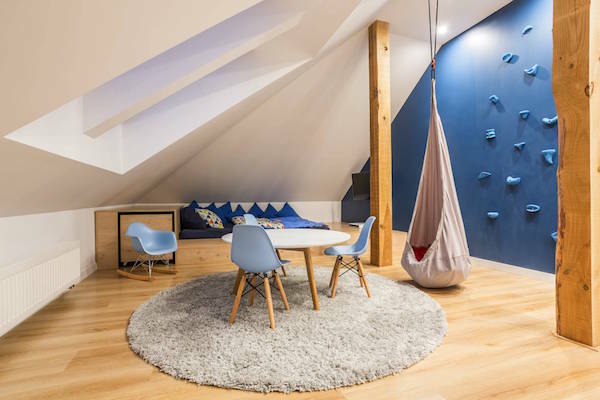 If your roof space has enough room, then a small corner can be turned into a cosy seating area for older siblings, friends or family members to chill out in. If you and/or your family are major bookworms then what an oasis a private library can be! By planning the loft space you have cleverly, you can cram in the maximum amount of books possible. Plus, if you’re a real library fanatic, you could even devise your own indexing method and invite friends and family to join your library. Play at being the librarian and provide membership cards and invest in a date stamp when lending out books! Awkward spaces can also be transformed into comfy seating areas, or beanbags can be neatly tucked away and brought out when that hot cuppa and classic read are needed. If you are a novice photographer, love taking photos as a hobby or are looking for studio space as part of your photography business, then your loft can be the perfect solution to keep your clicking addiction going. Painting the whole room white and installing professional lighting can lead to stunning results. A simple but clever conversion. Imagine being able to completely unwind at the end of the day by climbing up to the top of the house and relaxing in your own sauna. Especially if you have views to look out to whilst you have some all important ‘me’ time. The majority of attic saunas have to be built to specification so as long as you have enough space to work with, and access to electricity then can install this fantastic Finnish invention! Planning permission is not required for a sauna so the usual planning and building regulations need to be followed as they would for any loft conversion.